Rip rap revetments are a very effective method from limiting shoreline erosion in canals and waterways. Riprap, also known as armor stone, is commonly composed of clean washed limestone rock. The various angles and shapes of the rip rap help to absorb and deflect the shock of waves. This greatly reduces the amount of erosion and weathering on shorelines as well as marine structures such as dock piling, shorelines, and existing seawalls. Utilizing our special riprap installation barges and long reach excavators, Florida Marine Construction can build or repair your marine revetment even in the most exacting locations. Our shoreline mitigation experience can assist you through the pre-planning and construction phases of your shoreline restoration project. With more than 28 years experience constructing rip-rap revetments, breakwaters and “T” groins in the Gulf of Mexico, Florida Marine Construction can match the right riprap revetment solutions to your remediation or new shoreline protection project. Let us show you why we are the number one inland and coastal riprap revetment contractor in Southwest Florida. Lands-End Shoreline after gulf tsunami event. Severely scoured coastal shoreline after major tsunami occurrence on Redfish Pass. 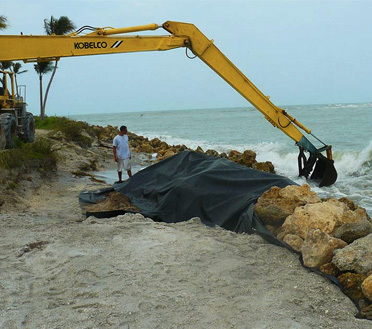 Florida Marine Construction performing emergency shoreline protection. Long Reach Excavator placing 3 ton armor stone on shoreline. Bolstering existing rock revetment, Redfish Pass, Captiva Island. Rip-Rap protected shoreline bordering Gulf of Mexico.